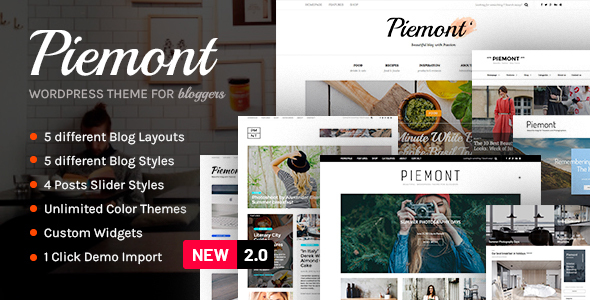 Piemont theme is one of the fastest, clean and aesthetic responsive WordPress Blogging themes with WooCommerce support on Themeforest. This theme can be used for any personal or business needs to easy create and launch your WordPress based blog or magazine in 2 minutes. Unlimited blog styles and layout combinations (20+ header styles, 5 blog listing layouts, 5 blog styles, 4 Featured Posts Slider layouts, 650+ fonts), Unlimited color themes (11 predefined, unlimited to create yourself), dozens of configurable options – and all of this you can manage with 1 click of your mouse in our advanced user friendly Piemont Control Panel.